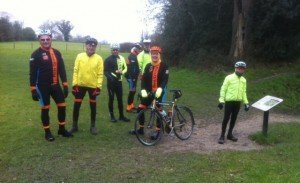 Ten riders assembled for a ride to Henry Street Garden Centre for coffee and lunch at The Swan, Sherborne St John. Colin had loaded the wrong route on his GPS, but fortunately Nigel and Graham had been sent copies of the right route - so all was well. 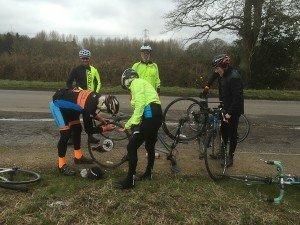 After Eversley Dave punctured and damaged his tyre - a call for the rescue service was made and we abandoned Dave, but by now we had picked up our Chairman so we were 10 again. Another puncture before lunch and a mild mutiny concerning the best route - ruthlessly put down and we followed the planned route thanks to Nigel and little help from Ed. Excellent pub where we met 5 friends from Alton CC/CTC. The group split after lunch with some opting for the 52 mile route and other's the 60 mile route. Note the excitement at seeing the Amphitheatre! 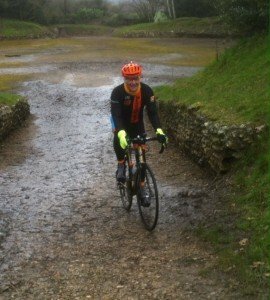 Colin inspecting the Silchester Amphitheatre for our Tri-Vet ride on 19th June.